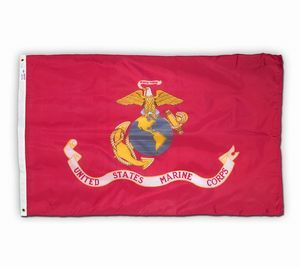 Our U.S. Marine Corps flags are made from the finest materials and feature a printed design on specially treated long wear nylon fabric. They are available in 2x3Ft, 3x5Ft, 4x6Ft, and 5x8Ft sizes. They are finished with reinforced stitching on all edges and nylon header with real brass grommets. Simply select your size from our pulldown menu and pricing will adjust accordingly.